Here’s something I hadn’t seen yet in my copious historical fiction reading: a book about Cicely Neville, mother of Edward IV and Richard III, also called “Proud Cis.” I had read Joanna Hickson’s two books about Katherine of Valois (The Agincourt Bride, reviewed here, and The Tudor Bride, reviewed here), so I was excited to read her new work. THE PLOT: Teenage Cicely is out hawking with her brothers, including her older illegitimate brother Cuthbert (Cuddy), when she is kidnapped by bandits. She is saved, but it’s out of the frying pan and into the fire as her “rescuers” are an estranged branch of Nevilles from her father’s first marriage. They have been feuding for years with Cicely’s mother, Joan Beaufort, daughter of John of Gaunt and Katherine Swynford. These Nevilles intend to hold Cicely until they get the portion of the Neville inheritance they believe they’re entitled to. Cicely is already engaged to Richard, the Duke of York, and this kidnapping could stain her reputation and put an end to the betrothal. Cicely finds herself bonding with one of her cousins in a romance that will haunt her years later, all through the Wars of the Roses. From here, the book trades off point of view between Cicely and her brother Cuddy. The reader gets Cicely’s perspective on the beinnings of the dispute through the crowning of Edward IV. Cuddy’s perspective gives details of the various battles. MY TWO CENTS: Everyone knows I love historical fiction, and of the three Joanna Hickson books I’ve read, this one is my favorite. This one felt truest to the characters and the action. Cicely isn’t 100% likable, and her actions ring true to the nickname “Proud Cis.” She does some nasty things she can conveniently label as “duty” or “loyalty,” when the truth is her actions are often about appearances. For some reason, I expected most of the book to be about young Cicely, either pre-marriage or during early marriage. I didn’t expect it to be quite so much about her married life and Wars of the Roses battles. I don’t know why, apparently just my misconception. So if, as a prospective reader, you’re thinking it’s just all about Cicely’s personal life, that’s not really the case. I also think it works to trade off Cicely’s point of view with Cuddy’s, and he’s the more sympathetic lead character. I rooted for him much more than I did Cicely, but that’s partially because I know where Cicely’s life leads. I didn’t know where this book would lead Cuddy. 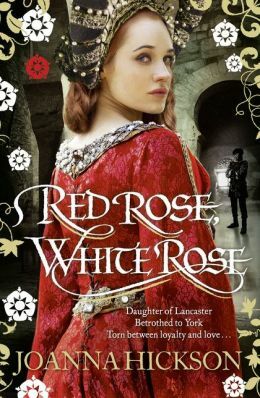 BOTTOM LINE: The Wars of the Roses seems to have taken the place of the Tudor period now in popular historical fiction, and this is an interesting and different read about the period. I enjoy Hickson’s writing and am looking forward to her next book on Jasper Tudor. ON SALE DATE: Available in the US on July 7, 2015, in paperback and eformats. Already available in UK.